2 way dat binding uses a different approach. 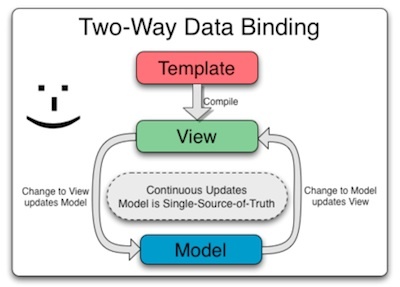 The view is generated from the template and is constantly sync’ed up with any changes in the data model receives. Also once the view changes (mostly because of application user interactions) model gets updated with new data as required instantly. This way application user doesn’t have to refresh or reload the page in order for user to see the data changes. From the users perspective view changes happen near real time. The main requirement for this – all this process has to happen on the application client side. 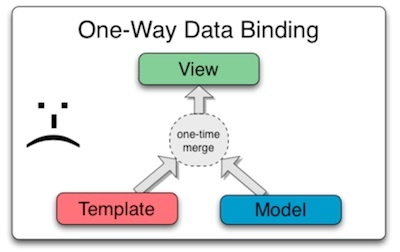 This is the main reason Angular.js framework supports 2 way data binding very well. It runs on the client application side and can constantly run the synch / refresh between what app users see and any data changes on the model side.